A permanent transparent and colour-enhancing polysilazane coating with a gloss finish. Used on non-porous surfaces like aluminium, stainless steel, coated surfaces, plastic and trespa. 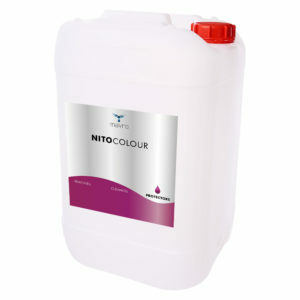 A permanent transparent and colour-enhancing polysilazane coating. Used on non-porous surfaces like aluminium, stainless steel, coated surfaces, plastic and trespa. This version is specially developed with a matt finish. A permanent transparent and colour-enhancing polysilazane coating. Used on non-porous surfaces like aluminium, stainless steel, coated surfaces, plastic and trespa. This version is specially developed with a satin finish. A high quality silicone modified alkyd resin. 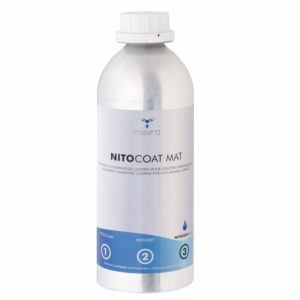 Excellent applicable as topcoat with an excellent durability. Usable on wood, and metal facade elements treated with NITOCOLOUR primer 1C. A fast curing alkyd resin primer. The primer has an excellent adhesion on almost all surfaces. The primer achieves a better adhesion of the NITOCOLOUR 1C. A durable UV-resistant 2-component polyurethane coating. Used on powder coated surfaces that are heavily weathered. The coating is available in all RAL-colours.